There’s something about the holiday season that makes you want to pull out all the stops. You want to show up with a dessert that makes everyone “ooh and ahh” about it. Plus, you want it to taste as delicious as it looks. 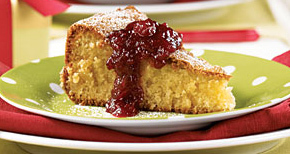 I’ve run the gamut from super-rich, chocolatey cheesecakes to dense almond tortes with fresh cranberry sauce. Each fit the occasion perfectly and was well worth effort. This year I’m on the hunt for a really awesome dessert. I’ve thought about making something I’ve already made, and know that the taste is guaranteed amazing. Or, I could pick something new that looks like it could be awesome. 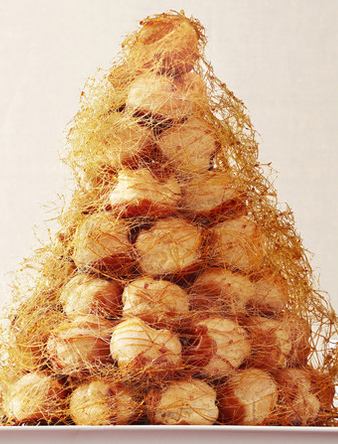 Like a croquembouche! I have a recipe for an eggnog cream-filled version, using white chocolate as the “glue” and drizzled over the tops of the pastries. It’s in the “Southern Living Big Book of Christmas” holiday book. It looks amazing! It’s going on the shortlist for now. I’m still on the fence about adding anything I’ve done before. If I did it would have to be the “Black Forest Tart” from the Taste of Home Holiday magazine I mentioned here. It was so rich and chocolatey. We’ll have to see!